Can anyone resist the luxury and charm of Shabby Chic Baby Bedding, for your stylist little baby? We sure can't! 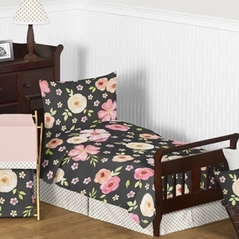 Our shabby chic crib bedding themes are perfect for your trendy baby. 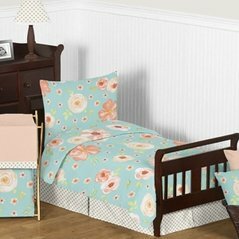 The elegant baby bedding collections have well-designed combinations of lavender and pale green in a floral print, coordinating mini floral print, and a matching stripe print that will make any room charming with elegant toile baby bedding. Beyond Bedding has many accessories for your shabby chic baby bedding sets, including a mobile, toy bag, and much more. Our matching accessories with your shabby chic baby bedding will make your room decor a perfect matching wonderland for your stylish baby bedding. From toile to princess and polka dot to camo, you will not be able to find a bigger selection of baby bedding sets anywhere else! If you like our shabby chic sets, you will love our plaid baby bedding for girls and our cowboy crib bedding for boys!